Caddick Construction, part of the Yorkshire-based family-run property and construction firm Caddick Group, is celebrating a major milestone at Moda Living and Apache Capital Partner’s Angel Gardens in central Manchester with an official topping out ceremony at the 35-storey development. The topping out marks Caddick Construction’s considerable progress at the JV’s flagship scheme since taking over from Carillion just 12 months ago, safeguarding 500 jobs in the process and reducing disruption on-site. Moda Living managing director Tony Brooks led the ceremony in front of 100 guests and stakeholders, symbolically cementing in a last trowel of mortar at the apex of the development. Once completed, Angel Gardens will offer 466 much-needed high quality homes designed exclusively for rent, ranging from studios to three-beds. 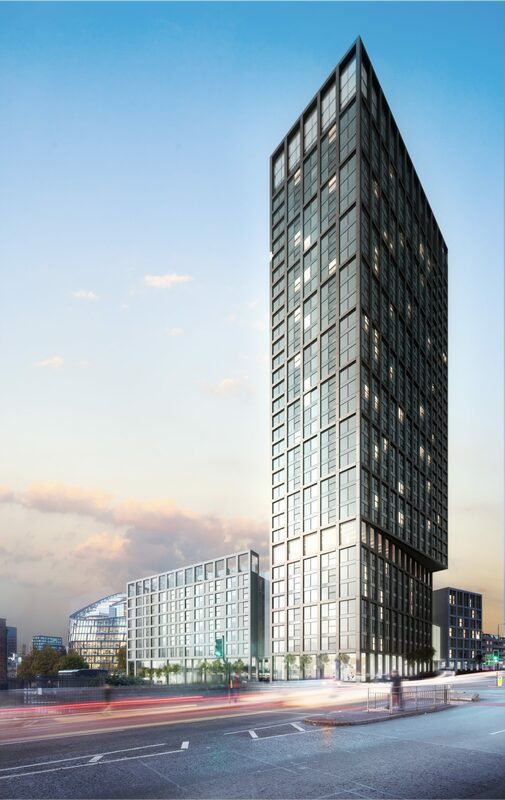 As well as enjoying one of the most iconic addresses in Manchester, residents will also have access to shared amenities including: a 24-hour gym, communal lounges, co-working space and multi-use roof terrace designed with residents’ physical and mental well-being in mind. The concrete core of the building was recently completed along with the concrete over structure while the glass and aluminium curtain walling of the imposing-looking tower is set to be completed by July this year, including all the windows and fittings. A show apartment giving prospective residents a glimpse of life in Angel Gardens will be available to view shortly. The build-to-rent project is one of the largest outside of London and was subject to one of the biggest funding deals since the financial crash, with pbb Deutsche Pfandbriefbank providing a £85m senior debt facility to bankroll construction. Angel Gardens, on the corner of Miller Street and Rochadale Road, forms a key part of the emerging 20-acre NOMA neighbourhood in Manchester city centre, where global e-commerce giant Amazon recently announced it would be opening its first UK headquarters outside of London. Practical completion of Angel Gardens will be in two phases, with the first apartments available this Summer and the penthouses finished by late Autumn 2019. Adrian Dobson, Caddick Construction’s Commercial Director, said: “Replacing Carillion on Angel Gardens was a real watershed moment for Caddick Construction, highlighting our ability to take on complex construction projects, safeguarding hundreds of jobs and, ultimately, delivering institutional-grade assets. Tony Brooks, managing director at Moda Living, said: “The topping out is a key moment for Moda as it brings together the last four years work on our flagship scheme, creating a truly iconic building in the heart of Noma.